We can assess and repair your your slope. CG Engineering can design a temporary or permanent soil stabilization solution for existing or new construction. 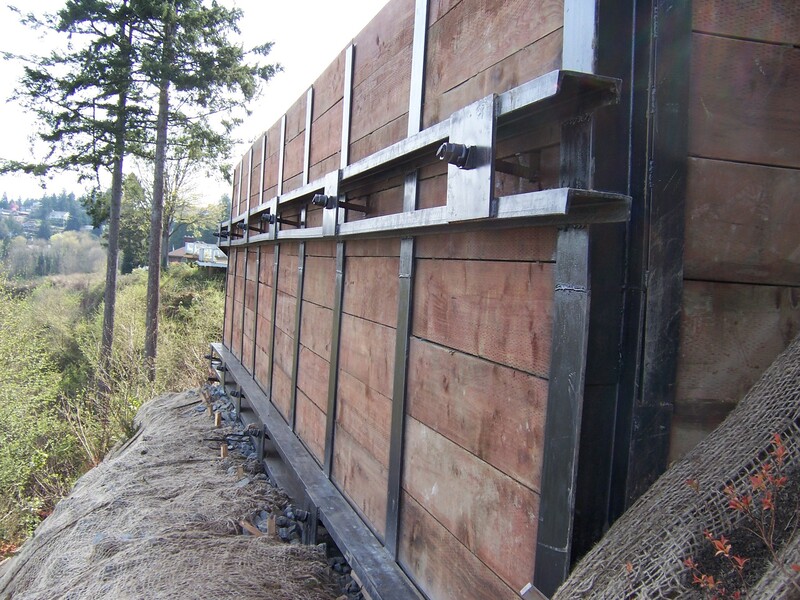 We specialize in temporary and permanent shoring design and have experience with cantilever soldier pile and tieback walls. We have designed walls over 50 feet tall. Our engineers work with a wide variety of jurisdictions and have the experience to successfully obtain permits for our clients. We also offer construction support services to ensure your design is built efficiently. Is my slope sliding? Why? The hilly and wet Pacific Northwest region provides the perfect conditions for landslides. Often these problems are exacerbated by poor site drainage, unchecked removal of vegetation and improperly compacted fill. If you have noticed any signs of an unstable slope on or near your property it is imperative that you remain vigilant in assessing the slope conditions. Conditions can change quickly and pose extreme life-safety issues if not addressed properly by a professional. Cracks or unusual bulges in the ground, street pavements or sidewalks. Structures such as decks and patios tilting and/or moving relative to house. Leaning poles, trees, walls or fences. Water saturated soil on a slope. Unusual sounds, such as rumbling, trees cracking or boulders knocking together, might indicate moving debris. Step One – Assessment CG Engineering will work together with a geotechnical engineer to assess the slope site and surrounding conditions. Often we find it helpful to have a contractor at the initial assessment meeting, to help collaborate on construction and design plans. Step Two – Develop Solutions CG Engineering will work closely with the geotechnical engineer to develop a repair or damage prevention solution. Repair solutions are unique to each situation, but commonly require a survey of the property. CG will assist you in obtaining a survey of the property, if needed. Often, soil stabilization requires the design of a retaining structure and drainage solutions. Our engineers will make sure you understand the solution and are comfortable with our plan before we move forward to permitting. Step Three – Permitting Our engineers will submit the design documents to your local jurisdiction for permit approval. CG’s engineers have experience working with most local jurisdictions and will be see to it that your permit is processed efficiently. Step Four – Contractor Bids and Construction CG Engineering will assist you in obtaining contractor bids for the project as needed. If you have already chosen a contractor, we will provide them our design documents and make an engineer available to answer questions throughout the construction process. Situations vary, but a typical fee for an assessment is $450-$500. 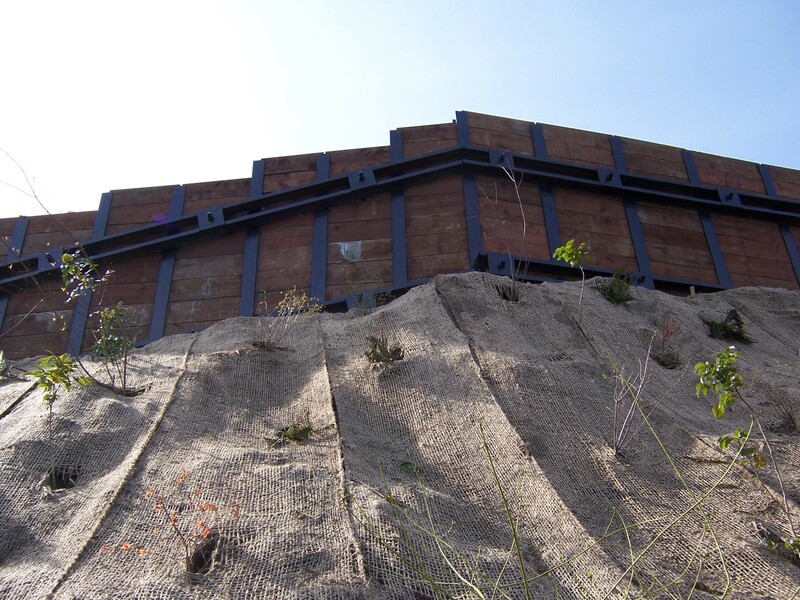 Does CG Engineering have experience working on slope stabilization? Yes, to see some of our work visit our Soil Stabilization Gallery. Why should I work directly with an engineer for soil stabilization? Our engineers will work on creative solutions that are safe and cost-effective. We have experience with many local jurisdictions and can prepare documents for easier permit approval. We have a wide network of trusted professionals to call upon if additional consultants are needed. Once a plan is developed, who will complete the work? We will provide you with construction-ready documents so you can get accurate contractor bids for the work. It is often beneficial to have a contractor involved from the beginning of the process, to help assess the situation. We can recommend someone we have worked with before, or you can choose any contractor you are comfortable with.